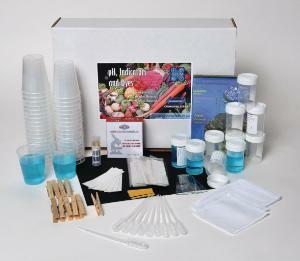 This kit is a unique teaching tool for introducing students to the chemistry behind plant pigments (the blueberry bio-pigment cyanidin) and how they can be used as pH indicators and fabric dyes. They use their knowledge to create their own pH test strips and evaluate them against a commercial type. Covered concepts include data analysis, accuracy vs. precision, bio-pigment structure, pH, pH scale, pH indicators, stains and dyes, acids, bases, acid-base interactions, solutions, and self-ionization of water. Ordering information: This kit includes four detailed activities featuring 'model' and 'inquiry' investigation paths for 11 investigational activities, which can accommodate up to 40 students. It also contains a DVD with PDFs of teacher and student guides and other digital content.